In the literary world of young adult books (or Young Readers to some), several series have made the jump to from “page to screen”. Of course, J.K Rowling’s Harry Potter novels are a prime example of a very successful endeavor of a studio adapting such books, becoming an extremely popular films series (and a widely favorable one at that) to an already extremely popular bestselling book series. Over the years, other studios have tried and attempted to bring these young readers books (age 8 to 12) to the big screen, including Rick Riodrian’s Percy Jackson series (Percy Jackson and the Olympians: The Lightning Thief and Percy Jackson: Sea of Monsters), James Patterson’s Middle School series (Middle School: Worst Years of My Life), and Jeff Kinney’s Wimpy Kid series (Diary of a Wimpy Kid, Diary of a Wimpy Kid: Rodrick’s Rules, and Diary of a Wimpy Kid: The Long Haul) as well as many more. However, despite their popularity with their readers, these film adaptations are, for lack of a better word, mediocre endeavors, producing adequate features with mixed reviews and mild box office results. Now, DreamWorks Animation (and Scholastic Entertainment) and director David Soren present the newest young reader adaptation with the film Captain Underpants: The First Epic Movie, which is based off of the book series by Dav Pilkey. Does this film produce a fun animated adventure or is it just another “run-of-the-mill” kid’s movie? In suburban Ohio, George Beard (Kevin Hart) and Harold Hutchins (Thomas Middleditch) are best friends, creators of Treehouse Comix (an outlet source for the pair to express heroism and mischief), and are notorious pranksters at Jerome Horowitz Elementary School, providing plenty of distractions for their fellow classmates, which draws ire from Principal Benny Krupp (Ed Helms), the school’s tyrannical principal, who is growing tired of the pair’s constant pranks. After making a mess at a science fair, Principal Krupp, reaching a sort of “tipping point” plans to separate George and Harold and to remove their mischief the friend’s partnership. However, the boys manage to hypnotize their principal with a “Hypno Ring”, leading Principal Krupp to believe he’s one of Treehouse Comix character, Captain Underpants. Controlling this comical superhero, George and Harold have fun with Principal Krupp’s Captain Underpants persona, but what starts out as fun time becomes very serious as the school’s science teacher Professor Poopypants (Nick Kroll) begins concocting a diabolical plan. Now, it’s up to Captain Underpants and his sidekicks George and Harold to save the day. Working at a bookstore, I’ve seen plenty of Young Readers books being adapted into feature film, with some rising to critical (and box office) acclaim while other bomb and face. Like what I said above, Rowling’s Harry Potter is the perfect example of an adapting a beloved young readers book as the movies (eight in total and told all seven Potter books) became a worldwide phenomenon and reaching universal acclaim. Of course, this action opened the floodgates (and lucrative possibilities) for others Hollywood studios to adapt these young readers novels, with most being series for future sequel installments. Unfortunately, most failed to reach prolithic praise that the Harry Potter movies achieved with many, including movies like Eragon, Lemony Snicket’s A Series of Unfortunate Events, The Golden Compass, Percy Jackson and the Olympians, and Diary of a Wimpy Kid received either only or two entries in their respective franchise and / or received mediocre to dismal reviews from critics, fans, and their box office return. To be fair, the tale of Lemony Snicket’s A Series of Unfortunate Events did survive by jumping to the small screen via Netflix and does seem to plan on telling its entire thirteen book series within a three-season story arc. (if you haven’t seeing it the show be sure to check it out. It awesome). So, with that knowledge in mind about young reader “page to screen” film adaptations, I actually wasn’t too sure about Captain Underpants: The First Epic Movie. Yes, I’ve seeing the popularity of the Dave Pilkey’s Captain Underpants books grow throughout the years, so it’s proven to be a fan-favorite with its target audience. But what about as a film (or rather an animated film)? Can it make the jump from book-to-film? The film’s trailer looks funny as well as displaying some unique animation and recognizable voice cast (Hart, Middleditch, Helm, Kroll). So, I was a bit interested in seeing this movie, but it wasn’t on my “must see” movies list. However, after hearing a lot of positive feedback from the film, I decided to check out this supposedly first entry or Captain Underpants. What did I think of it? Well, I actually liked it. Despite some minor nitpicks, Captain Underpants: The First Epic Movie does mostly succeed in its silly / zany premise by filling its animated tale with a lot of energy and laughter. Captain Underpants is directed by David Soren, who’s previous work includes several DreamWorks animated features such as Shark Tale (head of story), The Road to El Dorado (storyboard artist), and Turbo as director. Thus, in terms of directorial duties, Captain Underpants is Soren’s sophomore feature film and it’s definitely a major step forward in comparison to Turbo, one of DreamWorks’s lower animated movies. Perhaps one of the greatest strengths that Soren does in crafting this movie is keeping a faithful and / or spirited translation to its source material. I personally haven’t read a Captain Underpants book (from cover to cover), but I’ve skimmed through the original many of times and did pick up on its overall tone. Thus, for the movie, Soren, along with the film’s screenplay writer Nicholas Stoller, keeps the film’s story alive and joyful as well as keeping up with the spirit of Dav Pilkey’s books. Even looking beyond the movie’s source material, Stoller, known for directing and / or writing for such films as Forgetting Sarah Marshall, Get Him to the Greek, and Neighbors, keeps the film’s jokes rolling from one comedic gag to the next and deliver a humorous entertainment experience. Along with the film’ script, Soren interjects his own style and flavor into the film with the usage of the famous “fourth-wall breaks” and using several different styles of animation (i.e. hand drawn cartoon style, sock puppets, etc.) during various sequences. And yet, underneath the film’s narrative with all of its poop jokes and surreal premise, there is a touching story about the palpable earnest of friendship and the undeniable power of imagination. Additionally, the film also (whether intentional of not) pokes fun of the superhero genre as a sort of comic book parody, including costumed heroes and villains, sidekicks, and an origin story. In short, there’s rarely a dull moment in the movie as Captain Underpants moves briskly along within its 89-minute runtime. On a technically level, Captain Underpants is a solid animated film. While I did mention the various other animation styles that the film uses during certain scenes, the movie’s overall animation is great and fits perfectly in more top tier of animation movies of 2017. From the film’s overall style and concept design, Captain Underpants is easy on the eyes with a wide array of colors within its animation. Thus, even if a person doesn’t really care for this carton film (I’m looking at you parents), at least its pleasing to look at. While Captain Underpants soars high for an animated feature, it does have some criticism remarks than do drag it down. As one can probably imagine from its various marketing campaigns promos or even its source material, the film is definitely geared towards the younger crowd (aka the “juice box” crowd”). While this fine maneuver (Soren does it his target audience), the film doesn’t have that more “broader” family appeal, which is something that Disney, Pixar, or Illumination Entertainment would do. Thus, if a viewer isn’t that interested in childish potty humor, then there’s not much to latch onto with Captain Underpants. What I also noticed about this movie is that its main narrative is a little bit haphazard in its storytelling execution, including several plot gaps and stretching suspension of disbelief (even for a kid’s flick). These flaws don’t derail this mad-dash of a movie, but does hinder Captain Underpants from reaching animated greatness. The voice-over work in Captain Underpants are all solid and are a true highlight in the movie, casting several likeable actors to voice these comically characters and interject their own energetic enthusiasm into the feature. Comedian actors Kevin Hart and Thomas Middleditch proved the voices for the movie’s two main protagonists George and Harold. Hart, known for his roles in Ride Along, Central Intelligence, and The Secret Life of Pets, interjects a lot of his vocal energy and comedic timing in his character of George Beard, while Middleditch, known for his roles in Kong: Skull Island, The Wolf on Wall Street, and the TV show Silicon Valley, gives his character of Harold Hutchins the right amount of charm and boy-ish wonder. Naturally, the pair share a good vocal chemistry with each other and definitely shows within George and Harold. However, actor Ed Helms, is the real scene stealer of this animated movie. Known for his roles in The Hangover trilogy as well as The Office (the US TV show version) and Vacation, Helms essentially pulling off two separate roles within the movie, finding the ill-tempered and mean spirted Principal Benny Krupp and then able to quickly shirt gears to the sweet naivety heroics of Captain Underpants. Helms definitely nailed both roles, especially with Captain Underpants, whose character persona of being well-meaning yet bumbling heroics prove to be both charming and hilarious. With Captain Underpants being the superhero of the feature and George and Harold being the sidekick characters, then that would make the character Professor Poopypants, Jerome Horowitz Elementary School newest science teacher, the antagonist villain of the movie. 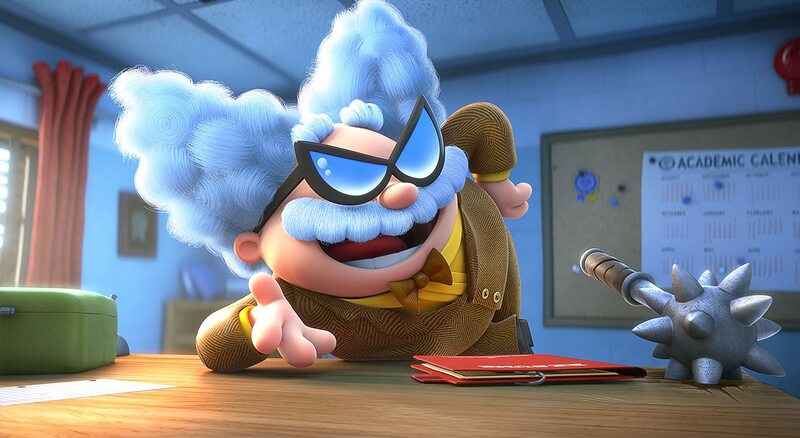 Voiced by comedian actor Nick Kroll, known for his roles in Sing, The League, and Sausage Party, the character of Professor Poopypants is definitely a comical riff / parody on the generic “mad scientist” archetype and Kroll is up for the challenge. There isn’t much to the character (one of the problem of the movie), but Kroll’s infuses the right amount of comical wit and cartoon-ish villainy into Poopypants to make the character memorable. 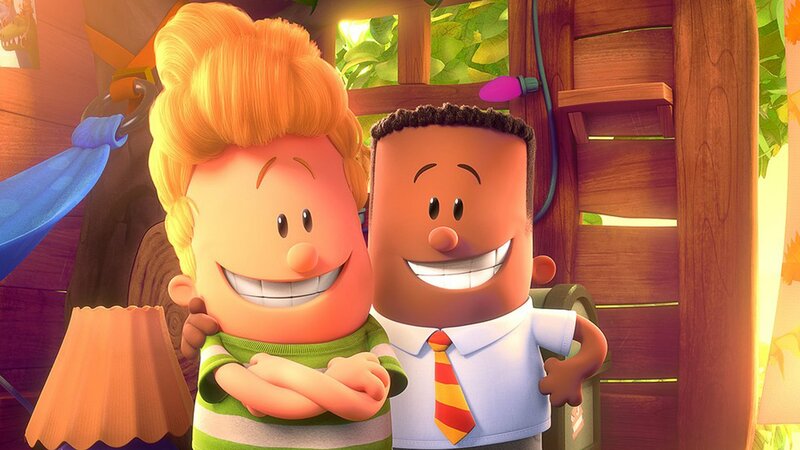 The only other voice actor worth noting in Captain Underpants is actor / writer / director Jordan Peele (Get Out, Keanu, and Key and Peele) as Melvin, one of George and Harold’s classmates who plays a part in the film’s main narrative. Best friends George and Harold (along with the comic book creation Captain Underpants) gear up to battle Professor Poopypants in the animated film Captain Underpants: The First Epic Movie. Director David Soren’s newest movie is indeed a zany and wacky feature that provides to be a hit for DreamWorks (especially after mediocre / mixed reviews of The Boss Baby) as well as keeping the spirit of Dav Pilkey’s books. Though its geared towards the more younger moviegoer crowd and doesn’t break new ground in kids animated storytelling, the movie is indeed a visually entertaining and provides a well-meaning story about friendship and imagination, underneath its child-ish toilet bowl humor. Personally, I liked this movie. Yes, it wasn’t a wholesome endeavor like how a Disney or Pixar film would be, but it definitely was a surprise hit for me, finding the animation style, voice work, and yes…even humor appealing to me. Thus, despite its specific target audience, I would have to say that Captain Underpants is solid recommendation. With the movie being titled Captain Underpants: The First Epic Movie and by the film’s ending, there’s plenty of room for a sequel installment to appear in the not-to-distant future. And I, for one, will be looking forward to it. Good review! I enjoyed it too and really hadn’t expected to. It’s very silly and, like you say, wildly out of control, but also fun and even heartfelt. Not sure whether I could sit through another hour and a half in a sequel without being left utterly exhausted! Haha…I think I could sit through another sequel of this zany story. Like you said it was wildly out of control, but it was still fun and pretty hilarious with its kid friendly potty jokes. Thanks for commenting! My nephews loved it, of course. Haha…I bet he did….and (surprisingly)….I did too!!! Awesome review! I loved animation and the “budget” look and feel of this appealed to me so much. Plus, the poop jokes were funny. Haha…..I’m glad that you liked it as much as I did. Hopefully, they make a sequel film. I hope so too! I’d be all over that!